Which states have the lightest tax burden? The answer isn't as straightforward as it seems. Figuring out the state with the lightest tax burden is not as straightforward as it seems. A state’s got to raise revenue in some way, right? Indeed, the 50 states and the District of Columbia find all sorts of ways to tax residents, and the Tax Foundation, as a public service, has just released its annual guide comparing them. Mining the fact book’s 55 pages, one can readily see that New York, New Jersey, Connecticut and California are not always the worst from a tax point of view. Anyone who’s ever driven I-95 between New York and Washington, for example, has probably grumbled about the fact that that the highway passes through Delaware seemingly just long enough to pay a $4 toll. Well, surprise! Delaware, it turns out, ranks first in the nation in tolls and user fees — meaning that such tolls and fees pay for 38.5% of state and local road costs in fiscal year 2012 versus the 0.1% toll claimed by tax authorities in No. 50-ranked Tennessee. Again, states need to raise revenue, but one can get a more nuanced view of how this is accomplished through the Tax Foundation’s “Facts & Figures,” which the Washington, D.C.-based nonprofit, nonpartisan research organization has been publishing annually since 1941 as a public service for taxpayers and policymakers. What stands out is that there are only five, rather than 51, governments listed, and while the range of rates varies, Washington state’s gross receipts tax reaches highest — all the way up to 3.3%. So while it is commonly known that Washington does not have a personal or corporate income tax, it does have a healthy “business and occupation tax.” So does Texas, another state known for not having an income tax, but which has the second highest gross receipts tax of the five listed — up to 0.95% on its so-called “margin tax.” As we’ve said, a state’s got to raise revenue somehow. In fairness to Texas and Washington, the two states’ tax burdens are relatively low in the aggregate. Wyoming, South Dakota, Nevada, Alaska and Florida, in order, have the best tax climates for business, whereas New Jersey claims the grand booby prize for worst business climate, followed by New York, California, Minnesota and Vermont. Again, the table provides nuance: one can see that California earned its low rank through high individual income taxes (with a rank of No. 50), high sales taxes (No. 42) and corporate taxes (No. 34), but with relatively light property taxes (No. 14) — a legacy of Proposition 13 — and unemployment insurance taxes (also No. 14). Another headline ranking is Tax Freedom Day, which measures how long Americans must work into the year in order to earn enough to pay all federal, state and local taxes. The U.S. average for calendar 2014 is April 21, but residents of the five lowest-taxed states beat the IRS’s April 15 deadline, starting with Louisiana (March 30), Mississippi (April 2), South Dakota (April 4), Tennessee (April 5) and Alabama (April 7). In contrast, tax servitude extends longest in Connecticut and New Jersey (both May 9), followed by New York (May 4), California (April 30) and Massachusetts (April 29). “Facts & Figures” has got something for everybody, including economists who conventionally view high debt as implying high future tax burdens. To that end, New Yorkers should be most worried, as combined state and local debt per capita totals $17,405. 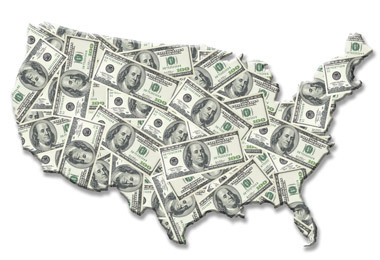 Massachusetts ($14,517), Alaska ($13,066), Connecticut ($11,928) and New Jersey ($11,623) round out the five highest-debt states (with usual suspect California ranking No. 8). The lowest-debt states on this somewhat stale table (for fiscal 2012) include Idaho ($3,930), Wyoming ($4,191), Arkansas ($4,742), Mississippi ($,4,891) and Oklahoma ($4,944). Finally, look to “Facts & Figures” for weirder excise taxes, usually sin taxes, with some states docking owners of guns and liquors and others in effect taking candy from kids. California ranks highest in that latter category, exempting groceries, even soda (which has recently entered the ranks of nutritional sin) from general sales taxes, but imposing a 7.5% tax on candy. As we’ve said, a state’s got to raise revenue in some way. — Check out more from ThinkAdvisor’s 22 Days of Tax Planning Advice.